On affections of the heart and in its neighbourhood. Cases, aphorisms, and commentaries. London : H. K. Lewis, 1876. Description : [i]-x.,  p., [3 l.] pl., -124 p.,  p. advs. ; ill.: 5 phot. figs., 2 tbls. ; 22 cm. Subject : Heart — Functional disorders. Author caption: By Horace Dobell, M.D., consulting physician to the Royal Hospital for Diseases of the Chest, etc., etc. M.R.C.S. diploma, St. Bartholomew's Hospital, 1849. Medical degree, St. Andrews, 1856. Physician, Royal Hospital for Diseases of the Chest, 1859-75. Consulting physician, Mont Dore of Bournemonth. Revised and enlarged from Medical Press & Circular articles. Journal title: On pain at the heart and in its neighborhood. London: Med. Press & Circ., 1869-1870. Index Medicus: 10308621300, 10509811040, 10510281390 (journal). 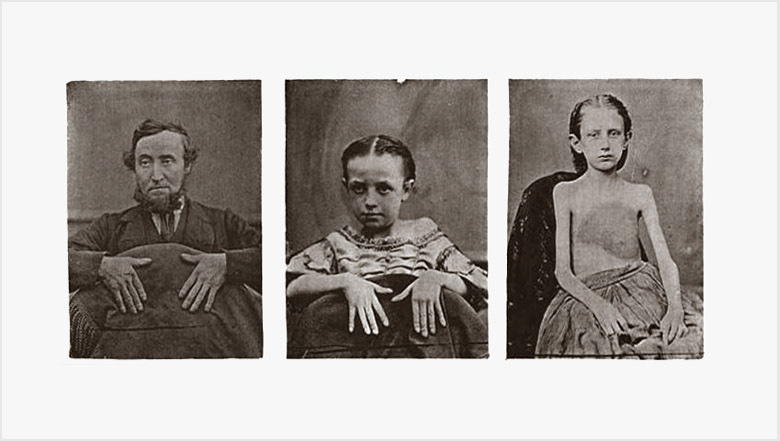 There are three collotype plates with 5 photographic images. The frontispiece reproduces an engraving of the anatomical heart. Plate 2 has three portraits, one of a 47 year-old male and two of a 14 year-old girl. Both subjects are posed to show digital clubbing caused by chronic inflammatory heart disease, however in the second image of the girl she is undressed to reveal a decomposition of skin and pronounced distension over her chest wall. Plate 3 shows a convalescence couch called, "The Heart-Bed."